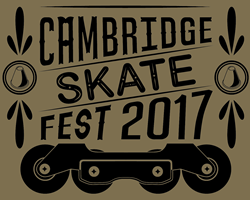 Save the Date for Cambridge SkateFest 2017 – Sunday, September 24th, 2017! Cambridge SkateFest is back for our third year to host a freestyle slalom and freeride skating competition in Cambridge, MA! Slalom and freeride skaters at all levels are encouraged to register and compete, and everyone is welcome to come and watch.